If you’re a regular to the site then you are probably quite familiar with my fireplace mantel and my love for decorating it. If you’re new to the site then you can get a better understanding of my love for mantels from my Autumn Mantel and my Christmas mantels: Rustic, Blue & Silver, Bright and Vintage. With a new holiday comes a new excuse to decorate my fireplace mantel. I will be showing off my Valentine’s Day fireplace mantel in all its glory next week; however, this week I am going to show you one of the ways I chose to decorate. I have a recent addiction to crafting with felt (as you may have seen in my Quiet Book post). Felt is simple to work with and you can use it in so many crafts. 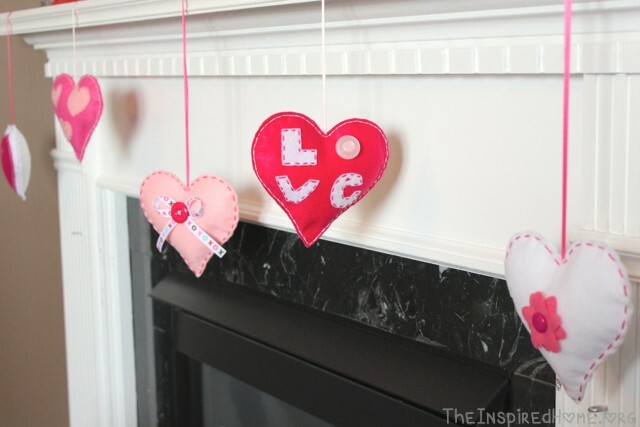 I decided to make fancy felt hearts to hang from my mantel! I decided that five would look best spread across the mantel – it’s a reasonable goal to complete in a few days. I made each heart a little different but stuck with a pink & white theme. I think they turned out pretty awesome! 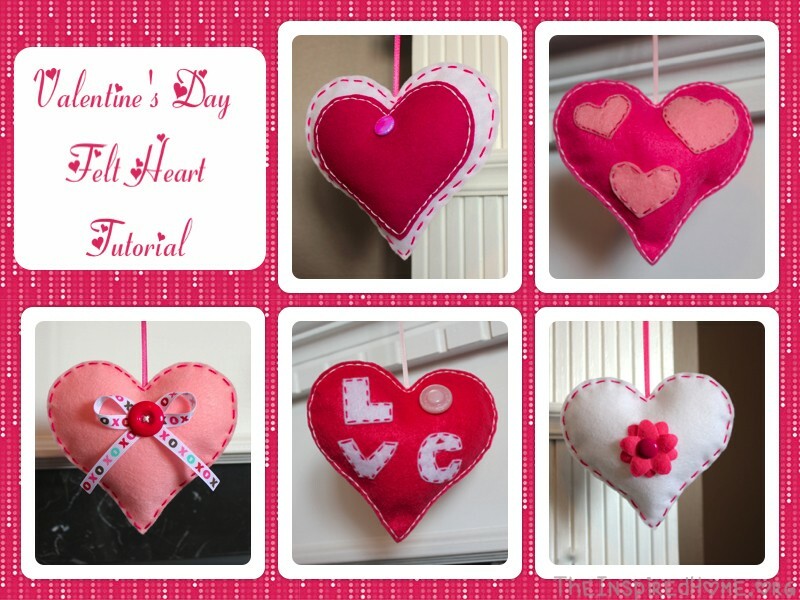 I really enjoyed making these hearts but this is something your older kids might enjoy as well – if you trust them with a needle & thread then they will do just fine. These also make great hanging decorations either from a doorknob or a hook. Attaching them in a vertical line would also make a nice statement piece! Do you like working with felt? Interested in getting started? Here’s a little tutorial on making Valentine’s Day Felt Hearts. Cut felt in half. The easiest way to do this is to fold it in half and pull the open ends down as you cut – the tension will make it easier as will fabric scissors! Take your halves and fold them in half. You will be cutting half of a heart shape just like you did as a kid with paper. Find a heart template by doing a Google search for heart outline (I went with this one). Copy the image and paste into Word. Make sure Word is set to 100% (bottom right corner). Using a folded, light-coloured piece of felt, place it over your computer screen and re-size the heart until it is the correct height to fit on the felt. One of my completed hearts has a smaller identical heart in the centre – simply copy and paste a second heart and resize to fit how you like. Print out the hearts and cut them out – I advise folding the hearts perfectly in half on the page and then cutting them out – this guarantees a symmetrical heart. 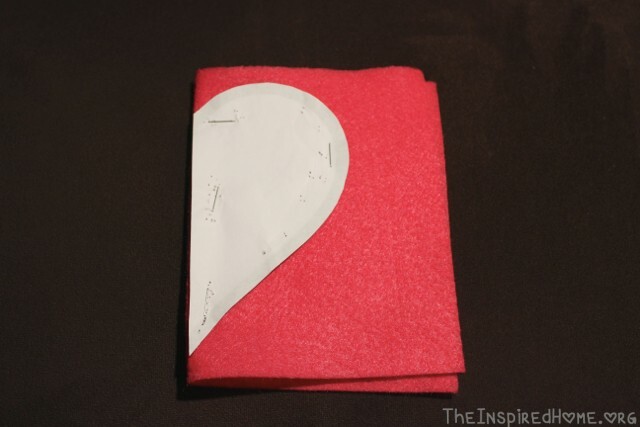 Take your folded felt, place your folded paper heart on top – ensure the folded edges are aligned. Staple them together. This is the most effective way I have found as pins tend to pucker the paper and the felt. The holes from the staples are easy rubbed out of the felt once you remove the staples. Once stapled, cut out your heart. Remove the staples and use the template again on your next piece of felt. Each completed felt heart requires two hearts – a front and a back. Once those are cut, lay them out on a flat surface and start mocking up your designs. For my LOVE heart, I cut the letters freehand (the “e” was a bit tricky!). Start attaching your embellishments (most will be sewn on). I like to use contrasting stitching and a variety of styles of stitches. Once your embellishments are attached, sew the two halves together. I like to do one heart at a time. Once all my hearts are mocked up, I will complete a heart from start to finish. Before you close off the heart, be sure to stuff with fiberfill and stitch your hanging ribbon inside. Hang your beautiful hearts from your mantel, stand back and admire your handiwork!